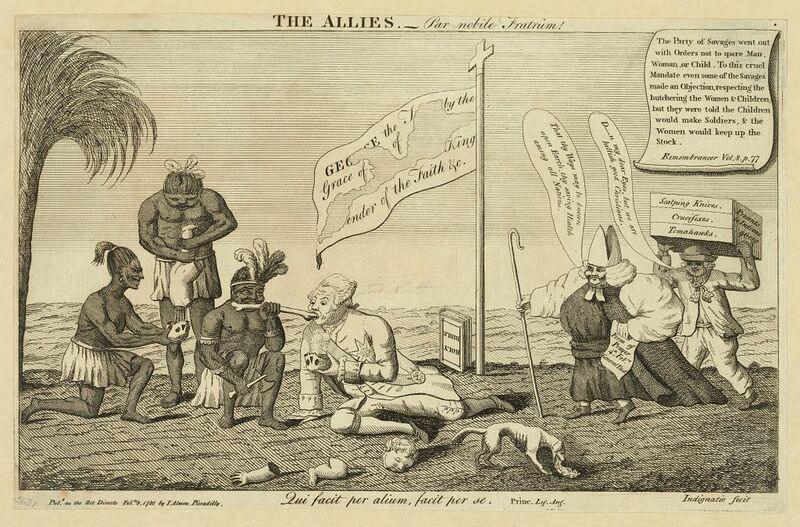 The Allies, John Almon, 1780, Library of Congress. This 1780 political cartoon by John Almon is easily the most intentionally provocative of all the images I've gone through so far. 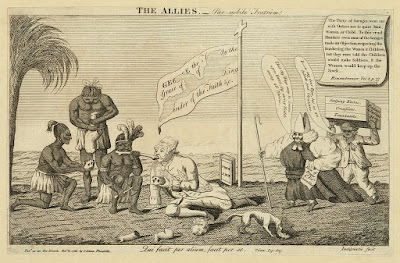 King George III gnaws on a human bone, while his native allies (portrayed here in racist caricatures) dismember a white child. This is all done with the approval of a fat bishop, beneath a cross with the tattered banner of the King, and beside an inverted Bible. A dog is so disgusted with the event that it pukes. The sailor is about the last thing I noticed in this image. Our sailor wears a round hat with an upturned brim. His hair is short with side curls, though a bit scraggly. Hanging loose from his neck and shoulders is a light colored plaid neckcloth, tied in a knot. It appears that this sailor does not wear a waistcoat, and there are no buttons on his jacket. His cuffs are slash, and likewise without buttons. The jacket ends just below the sailor's waist. The trousers appear to be belted at the waist, and end above his ankles. His shoes are pointed toed, but the buckles are too obscured to make out. Images like this one should raise a few red flags for the researcher. The only goal of the political cartoonist is to make a recognizable character as a stand in. Just as we wouldn't take this piece as a literal representation of bishops, kings, and native peoples, we likewise shouldn't take it as a visual document that is entirely correct in its portrayal of seamen of the eighteenth century. However, political cartoons must rely on images the public will recognize. His slop clothes must at least resemble that of a typical sailor at a cursory glance, or the audience would be entirely lost. Using this image (and others like it) in conjunction with others will contribute toward a better understanding of the average tar's garb.